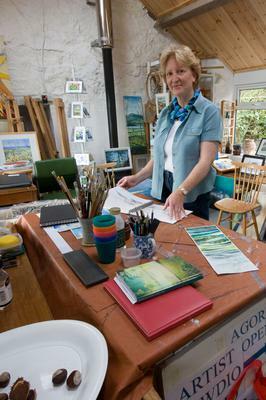 Artist Christine Garwood will be the tutor on two sketching walks and will be welcoming visitors to her unique studio in Malltraeth during the Anglesey Arts Weeks Open Studios and Galleries event, 28 March to 12 April 2015. "When I was a textiles student in London, I loved the Natural History Museum and spent hours there drawing the rocks, inspired by their pattern and form. I was drawn to Anglesey by its landscape and varied coastline. Anglesey’s rocks are internationally recognised as GeoMôn, a Geopark geological heritage area," says Christine Garwood, artist, art tutor and Vice-Chair of Anglesey Arts Forum. This year four ‘Art and Landscape walks’ are being led by Andy Short, a GeoMôn Guide, during the Anglesey Arts Weeks. Last year the walking tours proved very popular and this year two of the walks visit artists in their studios and two are sketching walks with Christine. Christine has taught art for over 30 years in North Wales. "I enjoy spending a lot of time painting and teaching. In the last few years I have come back to textiles, further developing my use of ‘freestyle’ machine embroidery on paper. Some of my mixed-media artwork contains stitching, which is rather like drawing or painting with thread," says Christine. Tour 1, on Wednesday 1 April, is a sketching walk with Christine and Andy, starting at ‘Good Gifts Shop’ in Brynrefail. Tour 2, on Saturday 4 April, is a studio walk with Andy visiting artists Maggie Jones, Jane Bunce and Michael Linford in their studios, starting from the Penmon Priory Car Park. Tour 3, on Monday 6 April, is a studio walk with Andy visiting Mark Kostiak, Allan Redfern and Terrill Lewis in their studios, starting from Brynsiencyn. Tour 4, on Wednesday 8 April, is a sketching walk with Christine and Andy, starting at the Llys Llyewelyn Tearoom, Aberffraw. All walks begin at 10.30am and return by 3pm. Bookings are limited to one tour for 2 people and can be made by contacting the Ucheldre on 01407 763361 or box(at)ucheldre.org. Further details on the materials to bring and the terrain will be provided on booking. If you can’t join one of the "Art and Landscape walks", you can plan your own artistic adventure using the event Guide which contains a handy fold-out map. The A5 colour Guide is widely distributed, and a PDF copy is available to download at www.angleseyartsforum.org. Over 60 artists take part all over Anglesey and all the members can exhibit one piece of their work at two locations on the Island: at the Ucheldre Centre, Holyhead (from 14 March), and at the David Hughes Centre, Beaumaris (from 28 March), until Sunday 12 April. The Anglesey Arts Forum and the Anglesey Arts Weeks Open Studios and Galleries event, including the "Art and Landscape walks", is funded this year by the Arts Council of Wales and the Isle of Anglesey County Council. The event is a unique chance to walk, learn about GeoMôn and sketch outside in the Anglesey landscape. Or you could use "The Guide" to plan your own visit to Anglesey artists in their studios to gain a unique glimpse of the artistic process. You will be warmly welcomed. Get more articles, subscribe to our free Anglesey Newsletter here.